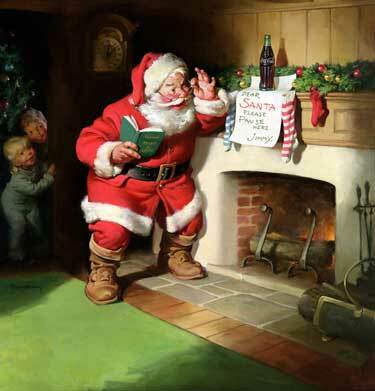 The modern Santa owes most of its influence to Haddon Sundblom, who drew the famous red-suited image for the Coca-Cola company from 1931 to 1964. The modern Santa can best be described as the creative offspring of innumerable artists and cultures, which each put their own spin on a real-life person, St. Nicholas of Myra. St. Nick was a 4th century bishop and Christian saint who lived in the area now known as Turkey. He is renowned for his charitable gift giving, which is popularized in a story of three young women who were too poor to afford a dowry for their marriages. As each reached a marriageable age, Nicholas surreptitiously left a bag of gold in the house at night. Some versions of the legend say that the girls' father, trying to discover their benefactor, kept watch on the third occasion, but Nicholas dropped the third bag down the chimney instead (and hence the tradition of Santa climbing down the chimney). For his helping those less fortunate, St. Nick became the patron saint of pawnbrokers-the three gold balls traditionally hung outside a pawnshop are symbolic of the three sacks of gold. People then began to suspect that St. Nick was behind a large number of other anonymous gifts to the poor, using the inheritance from his wealthy parents. Santa also borrows heavily from the English Father Christmas, who dates back to at least the 17th century. This figure was a rotund old man dressed in long green robes. His jolly disposition and extended waistline typified the traditional spirit of good cheer around Christmastime. 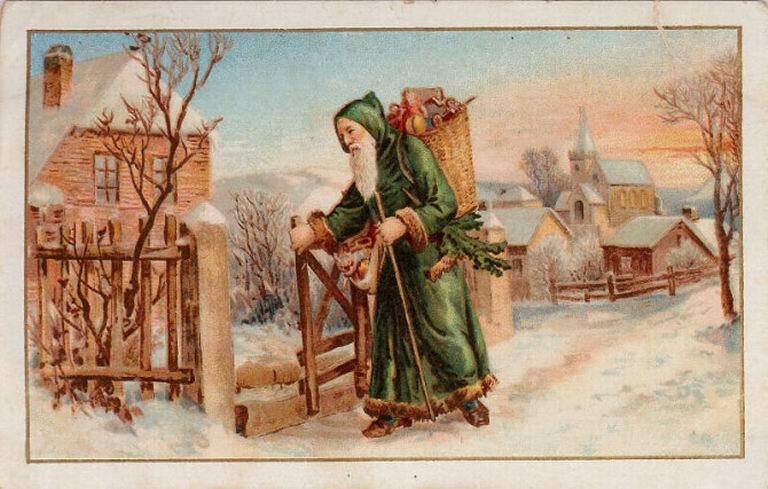 The English Father Christmas dates back to at least the 17th Century. Many traditions surround St. Nick, notably the one on his birthday, December 6. (It is also surmised this date was chosen to smother the Pagan celebration of the birth of Diana, a Roman goddess of the hunt and symbol of fertility.) Dutch children would leave a shoe outside their door with a carrot and hay for St. Nick's horse, in the hope that a gift would await them in the morning. Wait...St. Nick rode a horse? According to the Dutch traditions he did--over the rooftops! This is likely a throwback to the Germanic god Wodan (aka Odin), who rode through the sky on an eight-legged horse, and often traveled the earth disguised as a bearded man. 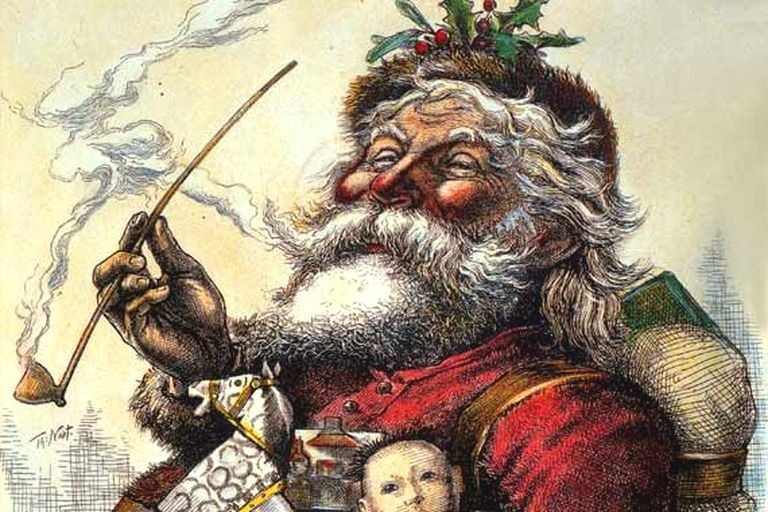 The St. Nick traditions were brought to the U.S. by the Dutch in the late 17th century, and were quickly popularized, most notably in Washington Irving's "A History of New York." It was here that the Dutch word for St. Nicholas--Sinterklaas--was Americanized to Santa Claus. In this satirical lampooning of Dutch culture, Irving painted Santa Claus as a rotund Dutch sailor with pipe and green winter coat, who rode into town on a horse to deliver presents. He later revised his story so that Santa rode over the treetops in a wagon. Perhaps the greatest development to Santa's character came in 1823, when an anonymous poem entitled "A Visit From St. Nick" appeared in a New York newspaper. The author most widely credited for this poem is Clement Clarke Moore, though Dutch-American Henry Livingston is also considered a prime candidate. Prior to this poem--which portrayed St. Nick as a "jolly old elf"--Santa was decidedly less jolly, for he often disciplined children (and perhaps ate a bit less). The poem also provided Santa with a sleigh and reindeer, two of which come from the German Donner und Blitz, which translates as "Thunder and Lightning." American illustrator Thomas Nast further popularized this image of Santa when he drew him for Harper's Weekly in 1863. The modern Santa, however, owes most of its influence to Haddon Sundblom, who drew the famous red-suited elf for the Coca-Cola company from 1931 to 1964. Sundblom, who was of Swedish origin, got his Santa idea from the Swedish tomte, mythical little creatures with red caps and long white beards. It is thus clear that Santa owes his origins to the ideas and traditions of many. Indeed, he is treated differently in almost every country in the world--the Brits, instead of giving milk and cookies, leave whisky and mince pies. Helps the night go a bit smoother, one suspects. (special thanks to www.wikipedia.org for reference materials). *The best selling trees are Scotch pine, Douglas fir, Noble fir, Fraser fir, Virginia pine, Balsam fir and white pine. *In 1856 Franklin Pierce, the 14th president of the United States, was the first to place a Christmas tree in the White House. *In 1963, the National Christmas Tree was not lighted until December 22nd because of a national 30-day period of mourning following the assassination of President Kennedy. *Tinsel was once banned by the U.S. government because it contained lead. Now it's made of plastic.